Few Canadians think there will be NHL hockey played this year. Disappointed NHL fans are more likely to side with players in dispute; half say they are less likely to attend a future NHL game. After talks between players and the NHL broke down on Friday, a new survey conducted by Abacus Data finds that six in ten Canadians believe that hockey will not be played in the NHL this year while 76% of NHL fans think the season will be lost entirely. Most NHL fans are disappointed with the lockout while a significant majority say they are angry and sad about the league’s lockout of players. 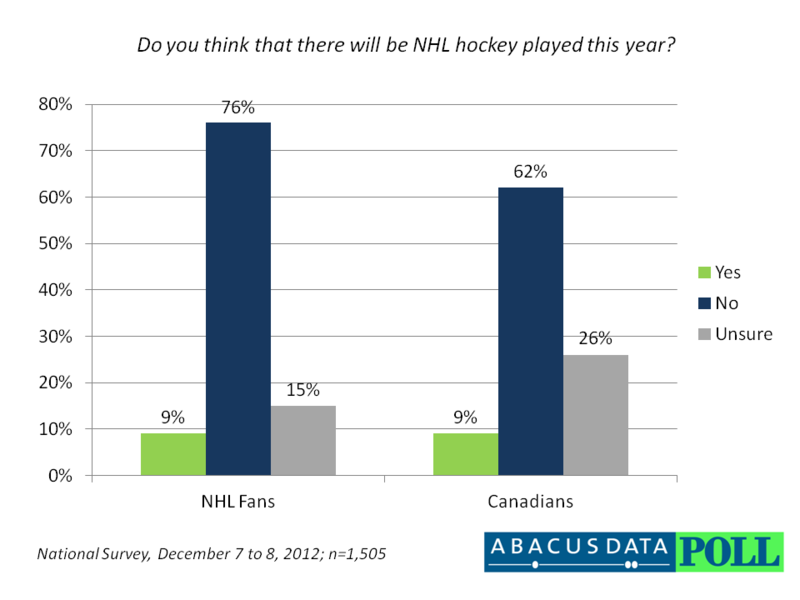 Few Canadians believe that NHL hockey will be played this year. NHL fans are disappointed and angry at the situation and that frustration could lead to them staying home when play resumes. 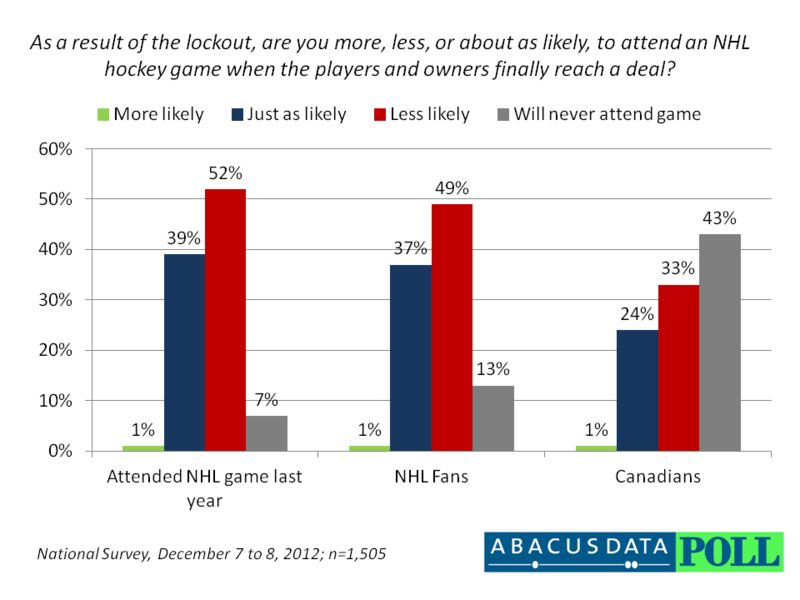 Overall, over one in three Canadians (38%) said they are following the NHL lockout very closely or somewhat closely. However, among those who self-identify as NHL fans, 87% said they are following the lockout closely. Most don’t think hockey will be played this year. When asked whether they thought NHL hockey will be played this year, a majority of Canadians (62%) said no while only 9% believed hockey would be played. Three quarters of NHL fans were pessimistic about hockey’s return while only 9% had hope that hockey would be played this season. Very few fans in Canada have any hope that hockey will be played this season,” said Coletto. “Across the country, fans and non-fans alike think it is unlikely that they will be able to watch any NHL hockey. When asked whether they would be more or less likely to attend an NHL hockey game as a result of the lockout, one in three Canadians surveyed (33%) said they would be less likely to attend a game while 24% said they would be just as likely to attend a game. Four in ten Canadians said they would never attend an NHL hockey game. But the impact of the lockout is likely to be greater among fans and those who attended an NHL game last season. Among NHL fans, 49% said they would be less likely to attend a game as a result of the lock out while 52% of those who attended a game last year said they would be less likely to attend a game if a deal was finally reached. The disappointment and anger that NHL fans have towards the lockout could definitely hurt the league and its team when and if play resumes again,” said Coletto. “With half of previous game attendees saying they are less likely to attend, the financial impact of the lockout on teams could be substantial. 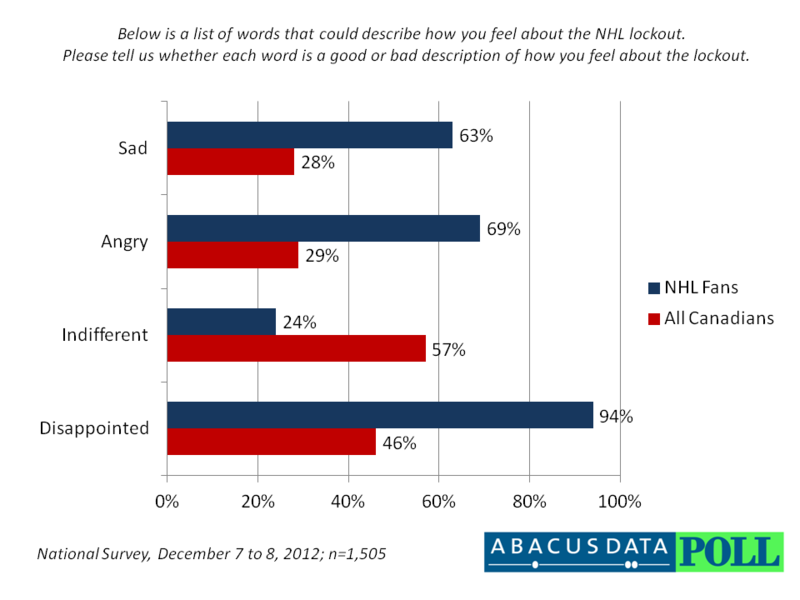 When asked whether a series of words describe how they feel about the lockout, most Canadians (57%) said they are indifferent while another 46% said they are disappointed in the lockout. Among NHL fans however, the feelings are more prevalent. Nine in ten NHL fans in Canada (94%) said they were disappointed while 69% said they were angry with the lockout. Another 63% said they were sad. While most Canadians are indifferent to the lockout, hockey fans in Canada are overwhelmingly disappointed and most are angry with the lockout. It’s not that fans are just disappointed, they are mad at the league and players for risking the entire season. When asked which side of the labour dispute they side with, 57% of Canadians said they side with the players while 43% said they side with the league. Among NHL fans, support for the players was marginally higher with 61% saying they side with the players. Canadians are split on whether the Stanley Cup should be taken away from the NHL. When respondents were told that the NHL is not the owner and sole purveyor of the Stanley Cup and that the trustees of the trophy could refuse to let the league use it, 36% of Canadians would support the trustees taking it away from the NHL if there is no NHL season this year while 27% were opposed to the idea. NHL fans were more divided on the question. Forty-five percent of respondents would support the trustees taking away the Stanley Cup if there is no NHL season this year while 41% said they were opposed. While few Canadians are paying much attention to the NHL lockout and many say they are indifferent to the outcome, NHL fans are clearly engaged and upset. Fans are not optimistic that play will resume and almost half are so mad they want the trustees of the Stanley Cup to take the trophy away from the league. The over 8 million NHL fans across Canada are disappointed and angry at the dispute and most may wallets as a result. The players seem to be winning the public relations battle, but the entire NHL may lose the war. Note: an oversample in Ontario was also conducted surveying a representative sample of 821 Ontario residents aged 18 and over. The Ontario sample was weighted according to census data to ensure that the sample matched Ontario’s population according to age, gender, education level, and region.